What are the benefits of being a CIO instead of a CIC? 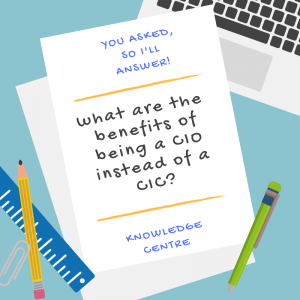 You asked, so I’ll answer – What are the benefits of being a CIO instead of a CIC? This is such a common question, especially now conversion from a CIC (Community Interest Company) to a CIO (Charitable Incorporated Organisation) is much easier than it was previously. A CIO is a charity that is just regulated by Charity Commission, rather than most charities that are set up as charitable companies which are regulated by Charity Commission and Companies House. But why would you pick a CIO over a CIC? Or why would you want to convert your existing CIC to a CIO? It usually comes down to practicalities of your day to day operations – and the lack of opportunities to generate income from your core services/activities and from your main customers (or beneficiaries), as well as no desire to create an unrelated product or service to trade and generate profits from to subsidise your core services. As well as the recognition that you’re likely to need grants and donations to survive and deliver the support you want to. This trading income versus grants is usually one of the key deciding factors when becoming a CIO instead of a CIC. The other key deciding factor is whether you have a charitable purpose (and public benefit) or not. If you do, then you’re more likely to set up as a CIO or other type of charity, because you’re eligible to do so, and because you’ll also qualify for the tax and other fiscal benefits. CIOs are charities so they benefit from tax breaks that CICs don’t get. You’ll pay no tax on income providing its related to your charitable objects (purpose) or below the limit for non-charitable income. You can also claim Gift Aid on any donations – meaning they are worth 25% more than the amount that’s donated. You’re also more likely to get 100% rate relief – but at the very least you’ll get 80%. You’re unlikely to get the other 20% if a large proportion of your income or funding comes from your Local Authority. CICs on the other hand may get 80% relief and in some areas they receive the additional 20% but it’s not typical. The charity would be eligible to apply to a lot more trusts and foundations that only give grants to registered charities. From a VAT perspective, certain activities delivered via a charity qualify for concessions, and charities don’t pay stamp duty land tax when purchasing properties or leases. Charities also receive a lot of other benefits – such as free software, free or low cost donations of goods, the ability to sign up to numerous online search engines that donate to charities, as well as things like Ebay for charities and many more. You can also do charity collections, hold fundraising events and lotteries – all of which are better to do as charities, as they are regulated whereas CICs can just do these things without any regulation. Charities are also more widely recognised and you won’t get asked “what’s a CIC?” all the time. But public opinion of charities isn’t high at the moment, and neither is their trust of charities. You’ll need to think about how you get paid with a CIO – and make sure the Articles include the ability to make payments to trustees if you intend to be on the Board as well as working in the CIO. There’s usually a limit though – of a maximum of 25% of trustees being able to be paid for services they provide to the CIO. However, trustees cannot be paid for undertaking their trustee role – it must be additional services. As a result of this, many individuals don’t become part of the Board, so there are no conflicts of interest between their trustee role and their day to day employment in the charity – but this is often a difficult decision as it means giving up strategic control of the charity and decision making to the Board. What’s not so great about CIOs is the regulation – Charity Commission isn’t as light touch as the CIC Regulator and the reporting requirements are more onerous, as well as the need to have an active Board of trustees in place. The threshold for requiring an independent examination and an audit is much lower for CIOs than charities, so it’s likely to be more costly to get your accounts done. CIOs typically need a minimum of three trustees whereas a CIC can be set up with one Director. CICs are ideal if you want the flexibility of delivering something entrepreneurial that also benefits society, without the governance associated with a charity. A CIC also gives you the flexibility to adapt to changes/external circumstances more rapidly than you can with a charity. If you’re not sure whether a CIO or a CIC is the right route for you, get in touch.